The Workhouse Arts Center (WAF) is proud to announce a call for entries for its annual Workhouse Clay International Exhibition 2019. This is an “Open Call” for functional and/or sculptural ceramic artworks. The Workhouse Arts Center is excited to continue promoting and exhibiting the best of contemporary ceramic artwork being created throughout the US and abroad. Peter Beasecker was born in Toledo, Ohio and received a BS degree from Miami University and his MFA from Alfred University. He is a Professor of Art teaching ceramics and graduate studies at Syracuse University’s College of Visual and Performing Arts. Beasecker has received numerous awards and distinctions in his career, most recently being named a NYFA Fellow for 2015. He has exhibited extensively in national and international venues, and his work is included in the collections of the Renwick Gallery of the Smithsonian Institution, The Minneapolis Institute of Art, and the Mint Museum in North Carolina. Beasecker has been a visiting artist and workshop leader at over sixty institutions, including Anderson Ranch, Arrowmont School of Arts and Crafts, Haystack Mountain School of Crafts, and the Penland School of Crafts. He has been the co-coordinator of the Utilitarian Clay Symposium at Arrowmont since 1996. 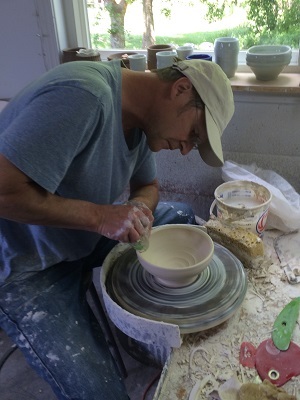 He currently maintains a studio in Cazenovia, New York. Open to all ceramic artists 18 years and older. All works must be primarily ceramic. Mixed media works will be accepted only if ceramic materials are the primary media. The juror will make final determinations. Size is limited to artwork that fits through a standard door. Floor works must be firmly stable. Large scale installations shall be installed by artist. Wall-mounted pieces are limited to 20 lbs. per section. Work must have been produced within the last 3 years. Please visit www.workhousearts.org , www.workhouseceramics.org for a detailed prospectus. Selections will be conducted from images of works. No substitutions will be allowed. Per Juried Arts-Label each image using the Art Type dropdown box. All artwork should be labeled Image 1, Image 2, Image 3. If including a detail image, label it Image 1 Detail, Image 2 Detail, etc. The image number of the detail should match the corresponding artwork image number. Please proof read your entries carefully as this will be the information used to generate any publicity information. · A brief artist statement of no more than 150 words describing your artwork (This event utilizes a 'blind jury.' Do not include your name in the artist statement). * Artist must be ready to upload professional quality JPG images. * The resolution of images should be 150DPI minimum; 300DPI maximum. * Images need to be smaller than 15MB. Non-refundable $30 payable through PayPal for up to 3 artworks/entries (2 images per artwork-includes one detail). Delivery of artwork-being hand-delivered: August 5, 2019 10am-5pm only! Pick-up of Delivered Artwork: October 14, 2019 10am-5pm only! Artists are responsible for shipping their work to and from the Workhouse Arts Center and insuring it while in transit. Works may be shipped, or hand delivered to the Workhouse Arts Center. Works must be shipped in reusable containers and packaging for re-packing and return shipping. Artist must provide a pre-paid return shipping label or check to cover return shipping costs*. Please! Absolutely! No Shipping Peanuts! If you must use them, PLEASE place in bags first! *Any check received for return shipping should be for the same amount as it costs to ship to the Workhouse Arts Center. When determining return shipping cost, artist must be sure to use same address as it was sent from, same box dimensions and weight. The Workhouse Arts Center agrees to hold safe the work(s) of art and agrees, if unsold upon completion of the consignment period, to return the work(s) of art in the same condition as received, less reasonable wear and tear. Artists are encouraged to insure artwork(s) when shipping to and from gallery. The Workhouse Arts Center is harmless for any damage or loss whatsoever. The Workhouse Arts Center agrees to try to sell the work(s) of art at the price listed on the online application. Prices cannot be increased or decreased unless the Workhouse Arts Center receives those instructions in writing. The Workhouse Arts Center will conduct all sales through their sales gallery. A 30% commission on sales will be taken by the Workhouse Arts Center. Accepted artists agree to allow the Workhouse Arts Center to photograph work while on display for educational and publicity purposes. Images of accepted entries will be retained for the Workhouse Arts Center archives and may be reproduced and posted on its website and in printed materials. It is understood that works in the exhibition may be photographed, telecast, and reproduced for press and publicity purposes including but not limited to reproduction in newspapers, periodicals, magazines, in television programs and on the internet in connection with the exhibition and the Workhouse Arts Center. An Opening Reception will occur on August 10, 2019 from 6:00 pm to 8:00 pm at the Workhouse Arts Center-Vulcan Gallery.